Sibelle is a unusual variegated yarn. 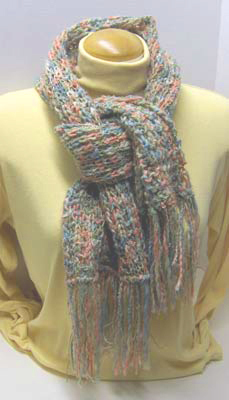 The composition of Sibelle is a strand of wool and a strand of viscose spun together. 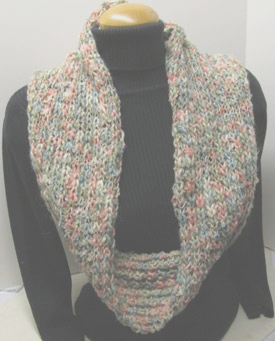 One strand of yarn is a pastel (coral/pink, pale green, pale blue and off white) variegated unspun wool thick and thin texture wrapped in 2 strands of very fine yarn. 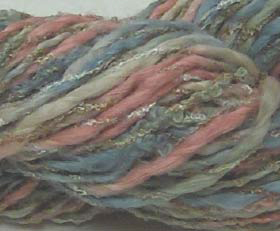 The second strand of yarn is a variegated crinkled viscose rayon (copper, white, gold) that is spun around the 1st strand. It is a very interesting yarn and makes a dramatic scarf, shawl, trim on something else, pillow covers. As you can see by the yardage on 100 grams and the suggested needle size that the yarn is thick and will knit up quickly. It is also a great yarn for weaving or crocheting.